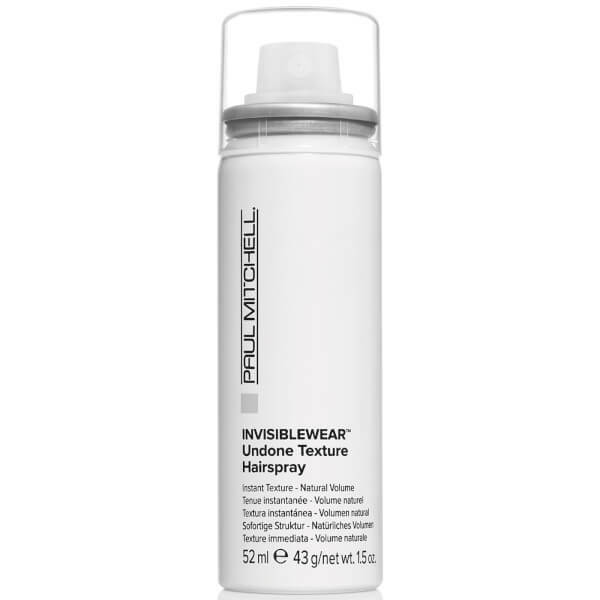 Create natural body and definition with the Invisiblewear™ Undone Texture Hairspray from Paul Mitchell. Enriched with nourishing Velvet Flower, the humidity-resistant formula restores softness and shine, whilst fighting frizz and taming unruly hair for salon-worthy results. The weightless, ultra-fine finishing spray delivers airy volume and flexible movement for a relaxed, lived-in look without crunchiness or greasy residue. Touchable hold. Paraben, gluten and mineral oil free. 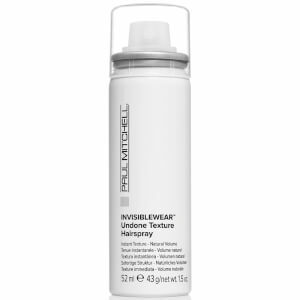 Apply to dry hair to boost volume and texture, style as desired. Hydrofluorocarbon 152a, SD Alcohol 40-B (SDS-IL-2096) (Alcohol Denat. ), Butane, Acrylates/Octylacrylamide Copolymer, Aluminum Starch Octenylsuccinate, Aminomethyl Propanol, Acrylates Copolymer, Magnesium Carbonate (CI 77713), Magnesium Stearate, Triethyl Citrate, PEG/PPG-17/18 Dimethicone, AMP-Isostearoyl Hydrolyzed Wheat Protein, Ethylhexyl Methoxycinnamate, Hydrolyzed Amaranth Protein, Parfum (Fragrance), Hexyl Cinnamal, Limonene, Linalool.